The early 1900s was a dangerous time for African American men, whether famous or nameless. Punishment from any perceived transgression against the Jim Crow power structure came swiftly in legislative, emotional, or physical form, and it could well take one’s life. Despite this reality, however, a number of African Americans still lifted their heads, straightened their spines, and spoke and acted against the mainstream. 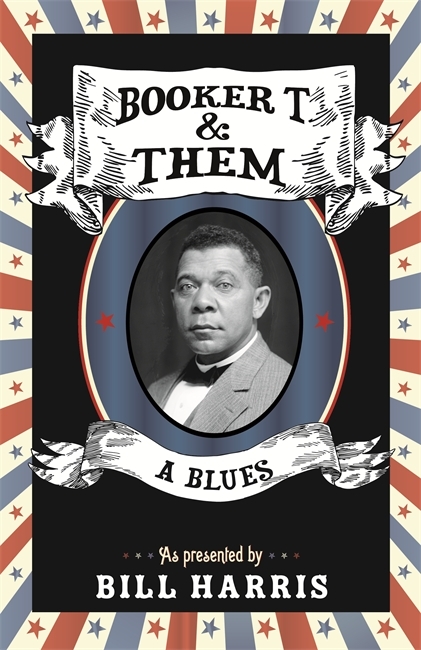 In Booker T. & Them: A Blues, poet and playwright Bill Harris examines what he calls “the age of Booker T.” (1900–1915), when America began flexing its imperialistic muscles, D. W. Griffith’s Birth of a Nation was released, and Thomas Edison’s many technological innovations set the tone for the United States to be viewed as the nation of the century. In the historical and imaginative narrative of this “bio-poem,” Harris considers several African Americans who sought to be men that mattered in a racist America, including Booker T. Washington, W. E. B. DuBois, William Monroe Trotter, George Washington Carver, and Jack Johnson, as he traces their effects on history and each other. In tandem, he visits white historical figures like Thomas Edison, Theodore Roosevelt, and D. W. Griffiths as well as some invented characters like students and professors at the Tuskegee Institute. Throughout, Harris shows that the rapid pace of early twentieth-century American change, progress, and science coincided with persistent and reinvented forms of white supremacy. Harris’s exciting structure offers varied rhythms and a blues sensibility that showcases his witty lines and vivid imagery.